Undisputed II is an improvement over the original. It has more bone-crunching fights. Heavy-weight boxing champion George "The Iceman" Chambers (White) is once again thrown in prison after being framed. But the twist is that he's in a Russian jail chock full of stereotypes. The only way to live.....is to fight the reigning champion Boyka (Adkins). It's a simple plot, but with a lot of setup towards the big fight. There are actually two fights between them though. All the fights are well-choreographed and exciting. White is a good replacement for Ving Rhames from the first. Adkins plays his bad guy to the hilt. You root for him to get knocked out every second. Ben Cross is on hand as another prisoner. He puts in a good performance also. The only weak point is the ending. It's too nice. I understand why they did that, but some of the grittiness is lost. 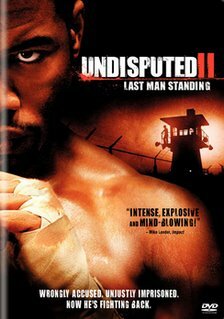 Overall, Undisputed II is worth seeing for the fights and White's performance. Undisputed II and III are probably some of the best titles that B-films have to offer.